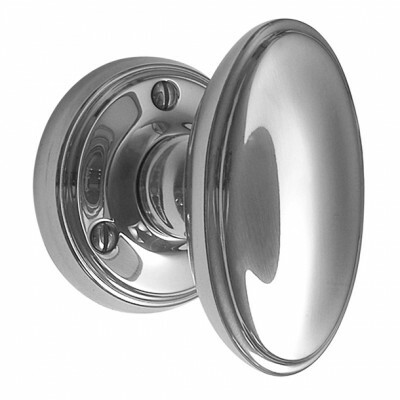 Constable Large Oval Door Knobs shown here in our main picture on a Face Fixed rose in a Chrome finish. Please note Covered Roses are extra. Please see Additional Info tab for important information on Care Instructions and living in Coastal Areas. These handcrafted fittings are Made to Order, so are non-returnable, please double check sizes before ordering and allow for a lead time of 2 - 3 weeks. Please contact us for pricing on Antique Silver. These Constable Large Oval Door Knobs are a beautiful example of an elegant design, inspired by Victorian styling but that would suit a wide range of period and contemporary homes. It is particularly suited to oversized interior doors or entrance doors. Choose from a covered rose for a lovely neat finish or face fix for a more traditional look. Our main picture here is Chrome with Face Fix rose and the thumbnails show both styles of rose in Unlacquered Brass and Chrome. 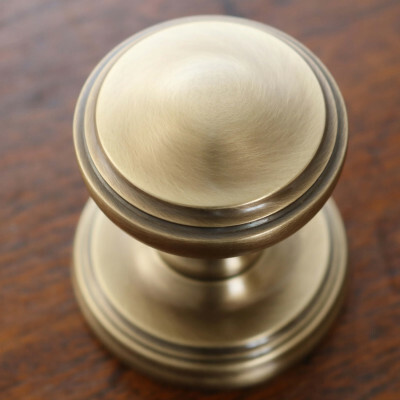 Made by a boutique British manufacturer who has been making fine handcrafted brass furnishings since 1935. They use long established hand crafting techniques so that each of their pieces is truly stunning and of the highest quality. 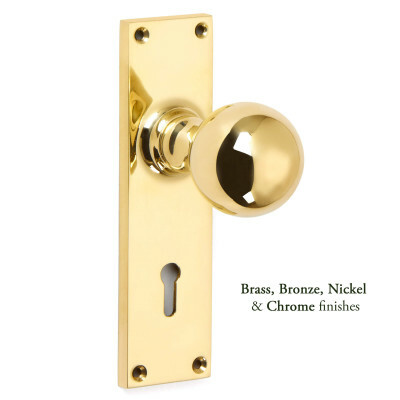 Each piece is cast or forged from solid brass and then hand finished in one of the many choices below. 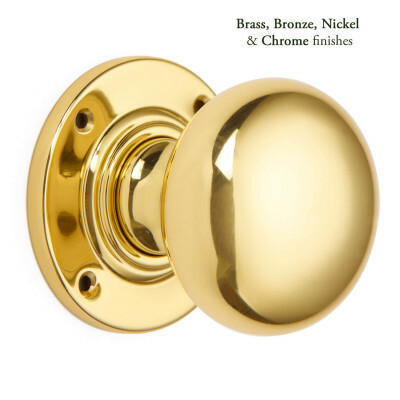 Choose from a range of Brass, Bronze and Silver finishes. For Antique Silver please contact us for pricing. ﻿For use with Mortice locks and latches and come Unsprung as standard. We do recommend using a Heavy Duty or Heavy Sprung lock or latch which is at least 100mm to give a backset of 75mm or more. This is to ensure that the door knob turns properly and returns to the closed position, and that you do not catch your knuckles on the door frame or striker plate. Sold as a Pair and supplied with matching fixings. Always make a small pilot drill hole and use a manual screw driver to avoid damaging screws and finish. All measurements are approximate and should be used as a guide only, this is due to the handcrafted nature of the products. These products are Finished to Order for each customer with a lead time of approximately 2 - 3 weeks, please contact us if you would like us to check stock before you order.